Bad news, my son has become a Dark Lord of the Sith. His mother and I are somewhat less than thrilled, but we respect his career decision. Truthfully though, we're hoping it's just a phase and he'll grow out of it before he, you know, subjugates whole star systems or blows up Alderan or something. Until then, we're having to call him Darth Catastrophe. The helmet has a vocoder that changes your voice into a weird parody of James Earl Jones. It also has a button that makes genuine Darth Vader wheezing noises. It's just so cool. I would have killed to have a Halloween costume like this, even if I was a teenager when the original Star Wars came out. The crappy resolution is because this is a cell phone picture. And yes this is one of the pictures I was trying to get off my phone this morning. Ah ha! I must have solved my software/sync issue say you. Wrong! I did an end run. I transferred the pictures using a mini-SD card. Because the stupid software is still choking on the phone. I may have my son give it a good dark side of the Force neck squeeze, that ought to fix it. Young Emperors of the Universe are so precocious. "I am your son, Jim." "Come to the dark side, my father." Yeah, the costume showed up in the mail yesterday. 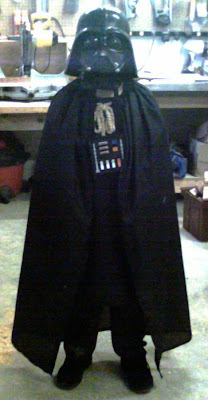 I was out in the shop and looked up to find my very own midget Dark Lord of the Sith. It's a wonder I didn't cut my hand off on the tablesaw. It amazes me that 30 years after Star Wars first debuted, kids are still infatuated with it. And that that kids seem to have the same opinions as their parents, i.e. Episode 3-6 were great, and episodes 1-3 were utter crap.